History | Your Dollar Store With More Inc. 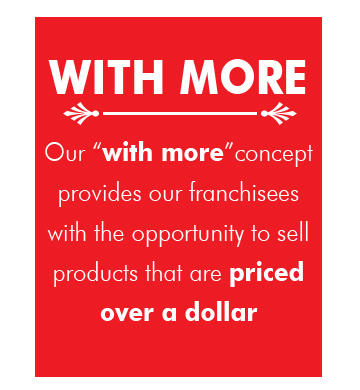 In the Spring of 1998, Russ Meszaros (President) and Sherry Meszaros had an idea – to raise the bar in the dollar store industry by opening a dollar store that was less cluttered, well merchandised, brighter, cleaner and more inviting for customers to shop. The idea expanded on the practical knowledge and experience Russ had gained from working hands-on in a major Western Canadian grocer. Within a few short months, Russ and Sherry opened their first store in Merritt, BC. Within weeks they opened their second corporate store in Kelowna, BC. These stores were such a success that they immediately started franchising this concept. Your Dollar Store with More now has well over 100 stores. Owning corporate stores gives us a hands-on approach that allows us to understand the daily operating issues faced by franchisees. This allows us to better assist you in dealing with suppliers, product selection, and day-to-day operations.